Hello lovely peeps. Well, my week off is certainly flying past - I'll be back at work before I know it... grr! Oh well, at least I have managed to s-q-u-e-e-z-e in a teeny tiny bit of crafting! 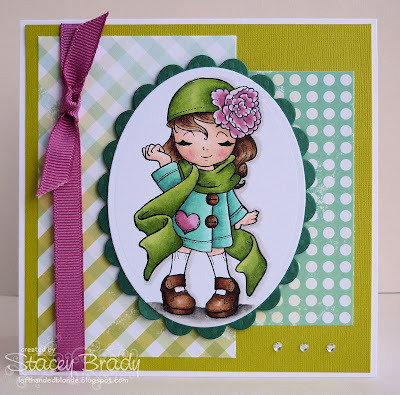 I made this one using this weeks Friday Sketchers sketch and it also fits in over at Stampin' for the Weekend where the challenge is to use ribbons and bows. Stamps: Madelynn by TGF, in stock here at Dies to Die For. Paper: Making Memories - Just Chillin'. Copic Markers: E00, E11, E29, E31, E33, E35, E37, E50, R20, R22, R81, R83, R85, YG03, YG63, YG67, BG15, BG23, BG49, W1, W3, W5, W7. Tools & Embellishments: Nestabilities, Ribbon and gems from stash. love it this was one of my fav friday sketches so far. I made two last night. I love the image you used she is one of my favorties from the greeting farm i need to order her as some point. Great job.